This new image, centred on the B[e] star HD 87643, beautifully shows the extended nebula of gas and dust that reflects the light from the star. The nebula appears at the upper right. The image was released by the European Southern Observatory on Aug. 5, 2009. A new lookat a distant nebula has revealed not one, but two stars locked in a cosmicdance that has shaped their dusty surroundings. Astronomerswith the European Southern Observatory used several telescopes to build the clearestimage yet of a region of space around the odd star HD 87643, whose lightreflects off surrounding material to illuminate it in a so-called reflectionnebula of wispy tendrils of gas and dust. The star also appears to shapethe nebula around it through solar winds and by regularly belching matter intospace every 15 to 50 years. Thoseejections, astronomers said, may be caused by a companion star found to becircling the main star in a highly elliptical orbit and at a distance about 50times larger than that separating the Earth and the sun. The Earth is typicallyabout 93 million miles (150 million km) from the sun. The two starslikely orbit each other about once every 20 to 50 years and may be encircled bya disc of dust, with the companion star triggering eruptionsfrom HD 87643 whenever it draws near. 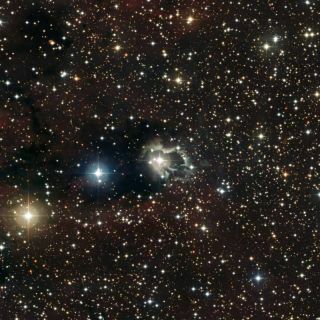 The star HD87643 sits about 4,900 light-years from Earth in the constellation Carina, orthe Keel. One light-year is the distance light travels in one year, or about sixtrillion miles (9.7 trillion km). A team ofresearchers led by astronomer Florentin Millour used the European SouthernObservatory?s Very Large Telescope Interferometer in Paranal and the 2.2-meter telescopeat the La Silla Observatory in Chile to observe the reflectionnebula and its double star heart. To buildthe close-up image of HD 87643, astronomers used adaptive optics to cancel outthe interfering effects of Earth?s atmosphere by making small changes in theirtelescope?s mirror surface. They also used a wide field imaging camera tophotograph the panoramic view of the star?s surrounding nebula and stellarneighborhood. Theresearch is detailed in a paper to appear in the science journal Astronomyand Astrophysics and was posted online.